James Adams junior (1785-1850) (pupil May 1806 - June 1809) or George Bailey (1792-1860) (pupil, assistant August 1806 - January 1837). Both have an entry in the office Day Book for 14 October 1807 but none for 16 October 1807. 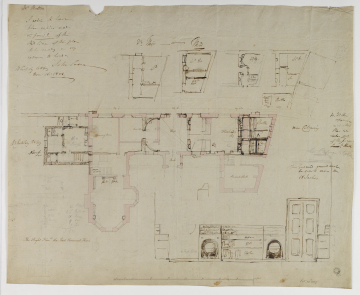 Soane's intervention (with alternatives) is to the area next to the kitchen and the servants hall. He also added a design for a bookcase with shelves for Folio, 2to (quarto) and Octavo - sized books (at the bottom of the sheet).